Bertie Matthews in the wheat fields above his family mill in Shipton under Wychwood. Matthews Cotswold Flour, based in Shipton under Wychwood,has launched two new flour products, reflecting a growing trend for artisan baking. Matthews Mill has been in existence near the railway line just outside Shipton since 1912 and is an iconic site in the Evenlode Valley. Flour is no longer transported by rail but traditional milling equipment including stone mills are still used to produce the stoneground flour. Bertie Matthews is the sixth generation of his family to run the business, joining the family mill a little over a year ago. He has brought a renewed energy and passion to the business at just the right time. 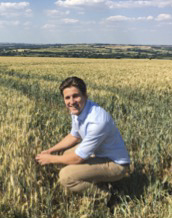 Matthews best-selling flours are Cotswold Crunch and Eight Grain and these will continue but as Bertie explains, the business has to reach out to more people if the mill in Oxfordshire is to keep working into the future. Matthews, like all good businesses, is looking forward from its home in the Evenlode valley.